Welcome! 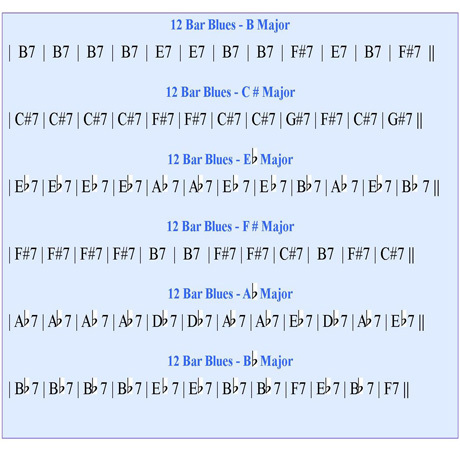 This page is designed to teach you about the 12 bar blues. As the lesson progresses, you will get a clear understanding of what the twelve bar blues is, learn the progressions used when playing it and how to play it in all twelve keys on the piano. Before we head into this lesson, it would be good for you to know a bit of history about the twelve bar blues. So, let us take a look back in time. The blues is an American music genre that was created as a result of African and European traditions merging. Its origin can be traced back to the 1800s. Afro-Americans are given credit for the creation of this unique musical style which expressed the message about the hardship and suffering of these people. One main elements of blues music is the use of bent pitches known as blues note. 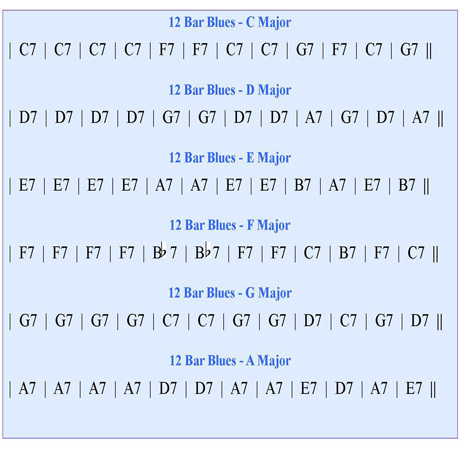 The blues is usually made up of harmonic progressions consisting of eight, twelve and sixteen bars. However, the twelve bar blues is most popular among the three. Some musicians have since doubled the twelve bar blues and call it the twenty four bar blues. The twelve bar blues relies on the three major chords of a major scale. These three chords create the main harmonic progression of this style of music. Below is a diagram showing the basic movements. The illustration above shows how you would play the twelve bar blues using three basic triads. However, a number of piano players play each chord with a dominant 7th (flatted 7th). Click here to view a lesson on 7th chords! Here is what the chord progression looks like if you should play each chord with an added dominant or flatted seventh note. One of the main objectives of this lesson is to guide you in playing the twelve bar blues in all twelve keys on the piano. Below are twelve illustrations that will help you accomplish this task. It is very important that you know how to play major chords before you attempt the activities in this lesson. Click here to learn how to form and play major chords on the piano! 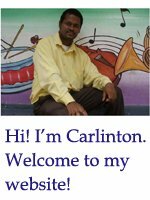 Also visit PlayPianoToday.com for more twelve bar blues piano lessons. Click here to leave the 12 bar blues page and return to home page!